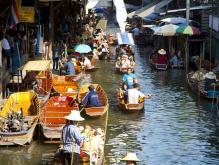 There are lots of floating markets throughout Thailand, and Damnoen Saudak is the most typical one. It is a very attractive place for tourists to see the old style and traditional way of selling and buying fruits, vegetables, etc., from small boats and wooden canoes paddled by Thai women wearing indigo-hued clothes and wide-brimmed straw hats, which has over 20-year history that become a unique scenery of Thailand. Traditional Thai houses standing on both banks, where tourists can look into the way Thai people live by boats. There is lots of chatter and activity – bargaining is common – that’s all part of the fun -- but don’t expect to get the price down more than a few baht. The best advice is to reach Damnoen Saduak around 7am or 8am to savor its original expression. By 9am the package tours from Bangkok arrive, draining what little authenticity is left. You can hire a boat from any pier that lines Th Sukhaphiban 1.